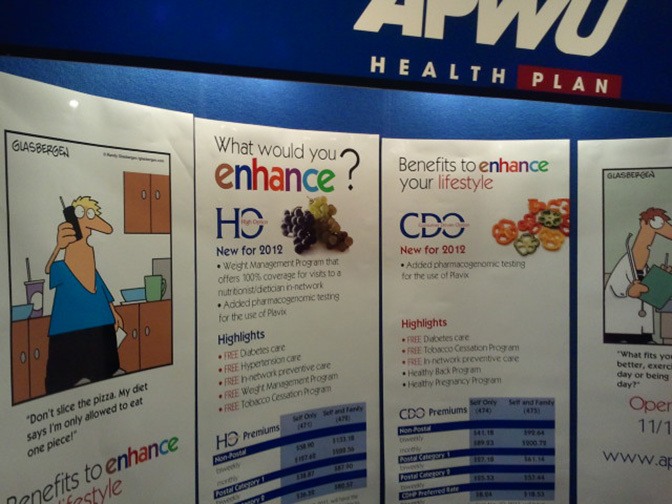 A customer recently sent me a photo of their conference display using my cartoons enlarged to poster size. I think the posters are great attention-grabber, so I thought I’d share this on my blog. My cartoons are often published in magazines, newspapers and newsletters, but others are licensing cartoons for trade show displays, conference videos, cartoons for seminar presentations, cartoons for meeting agendas, advertising flyers, brochures, cartoons for training manuals, cartoons for office posters, client calendars, flash animation and other innovative uses. If you have a concept that could get a boost from a colorful cartoon with a good message, please contact me to discuss your project. Glasbergen Cartoon Service offers thousands of cartoons on hundreds of topics at budget-friendly rates for any size business. Custom cartoons and comic illustrations are also available! Bright colorful cartoons with a message are available for trade show displays, cartoon posters, cartoons for trade show publications, cartoons for conference handouts, cartoons for trade show agenda sheets, cartoons for conference presentations, cartoons for seminar handouts, cartoons for video screens., cartoons for trade show posters, cartoons for trade show signs, cartoons for conference video screens, cartoons for trade show booths, cartoon posters for medical offices, cartoons for office posters, Cartoons at your conference or trade show are a great attention grabber and a fun way to enforce your message! Please e-mail for more information or a budget-friendly rate quote. More cartoons @ Glasbergen Cartoons. This entry was posted in Cartoon Publishing, Cartoon Services, Cartooning, Cartoonist, cartoons, comics, funny, News and tagged cartoon graphics for trade show display, cartoon posters, Cartoon Wall Signs, cartoons for conference displays, cartoons for conference presentations, cartoons for customer calendars, cartoons for flash animation, cartoons for intranet video screens, cartoons for medical offices, cartoons for office posters, cartoons for seminar handouts, cartoons for trade show and conference handouts, cartoons for trade show booklets, cartoons for trade show booth, cartoons for trade show posters, cartoons for trade shows, cartoons for video screens, cartoons with a message are available for trade show displays, Large Cartoon Posters, poster size cartoons, poster size comics on July 9, 2012 by RandyG.